← What is it with wine? I’ve been taking a bit of a break from wine recently and catching up on an old interest of mine – architecture – and eventually came across my copy of Andrea Palladio’s The Four Books on Architecture. Here I paused, partly because I was just so impressed by Palladio’s work, and partly because my mind started wandering back to wine. Specifically, I was thinking about well-balanced wines. All classical architects stress the importance of balance and harmony, but one of the strongest proponents is Palladio. For him there was little compromise. Architecture should follow the precedents laid down by the ancient Greeks and Romans, who in turn seem to have spent a lot of time obsessing about what looks right. And form should be determined by function: columns should look solid, arches unbroken, and the exterior should reflect the interior structure – there is no room for deception and trickery. 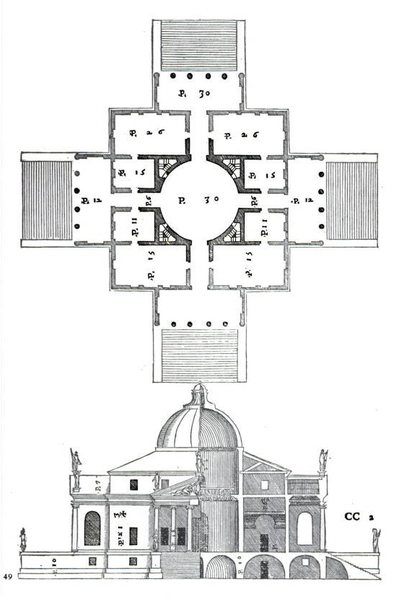 The Villa Rotunda is perhaps Palladio’s most famous building – see drawings above. I find it difficult to imagine any building more balanced, harmonious, stable and restful. Just looking at the drawings makes me thing of a beautiful well-balanced wine: one with all the correct elements present, but nothing out of place or obtrusive. OK it’s beautiful, but isn’t this all a bit boring? In both architecture and wine? I’m not sure I would use the word boring. I actually find harmony and balance rather stimulating in a quiet sort of way. But on the other hand I would not want everything to be balanced. Wonkiness, funk, flamboyance and individualism has its place. But it is reassuring to be able to return to the comfort and safety of classicism now and then. And isn’t the definition of balance rather arbitrary? It is all very well for the ancient Greeks and the wine trade to define balance in their respective fields, but what about the rest of the world? Yes it is arbitrary, but even if there are billions in the world who might disagree there is a broad consensus in our own little corner of Western culture. Sometimes, while not being blind to others, we just have to accept the culture in which we live. I might return in my blog with further architecture-wine pairs as there must be others if I put my mind to it. But for now I shall stick at this single example – one that occurred to me spontaneously – Palladianism and balanced wine. Just one final thought. Discussions of music and wine always seem to slip into matching the two, whatever that means. So how about a bit of architecture-wine matching? I have not tried it, but would love to. Of course, architecture is not meant to be enjoyed from drawings any more than wine is from technical specifications, so you should really taste the wine while wandering around the building, inside and out. It would be a lot more difficult to organise than music-wine matching, but if anyone would like to transport me to Villa Rotunda with some nice wine I will happily comply. The idea of enjoying wine in a Palladian villa sounds wonderful! This entry was posted in Tasting and taste and tagged architecture, balance. Bookmark the permalink.